The Gary Fong LSU-CLOUD Lightsphere Universal Inverted Dome Cloud Flash Diffusion System is a large, round, soft and flexible diffuser that slips over the front of any standard shoe mount flash unit. The inside of the Lightsphere is completely textured to make the light dispersion even more "soft" than it would be otherwise. And because of this design, it is possible to make the material more translucent, keeping the unit from losing a lot of light while actually increasing the diffusion and softness of light. An opaque color has been added to the inside of the Cloud version, and this "frosted" version creates an even softer effect, which makes it ideal for close-ups, portraits, and event photography. This Universal type fits almost virtually any shoe- or handle-mount flash unit. Its innovative mounting design provides a secure and adjustable grip to any flash head, from a Nikon SB-600 to a Metz 45 handle mount. This means there is only one model you need to buy, ever. Especially ideal for vertical flash shots where the flash coverage is still similar to horizontal shots, due to the large rounded shape of the diffuser. Minimizes the need for a flash-flip bracket. Box Dimensions (LxWxH) 6.2 x 4.6 x 4.6"
Lightsphere Universal Inverted Dome Cloud Diffusion System (Frosted) is rated 4.4 out of 5 by 292. Rated 5 out of 5 by Square Peg Jer from Great Diffusion Tool I purchased this after seeing tons of other photographers using them for weddings. Actually - I purchased the collapsible one first, but I was very dissatisfied with the lower degree of diffusion and the difficulty in getting it on my Nikon SB-900. The Universal works as advertised. It's easy to install (contrary to some reviews) on both my SB-900 and my SB-600's... It holds securely, and provides nicely diffused light. I find it works nicely with my studio umbrella light setup as well, if I decide to add a little fill light in the mix. Rated 5 out of 5 by richard from had reservations but bought it anyway I have several different MFR's cameras and their flash units so was not sure this would be UNIVERSAL - after receipt I found it works well with my Canon speed lights 420EX,580EX, and 600EX_RT and even the Fuji EF_42 Flash on the X-Pro_1 base. The diffusion is very nice and gives a soft more natural ambient lighting effect since it not only directs the strobe upwards but leaks forward light as well when used in the 90 degree orientation.Remember to install the wide rubber band on the flash unit before sliding the unit over the flash as it greatly improves the adhesion between the unit and flash so it won't slide off. Rated 2 out of 5 by Anonymous from I am disappointed I have a SB900 and was initially disappointed that there wasn't any Gary Fong diffuser that fit. Then the universal dome came out and I was, again, disappointed, and even more so surprised. It seems poorly designed and slides off the flash. I don't have time during weddings to readjust and re-strap the dome back on the flash. Also, it STILL does not fit the 900. Light leaks out from the bottom corners because it isn't wide enough to fit the size of the 900. The cap on the dome pops off as well every so often. I doesn't give a very professional appearance when your equipment keeps falling off in all directions. Rated 3 out of 5 by Anonymous from Yes and no for this model The Lightsphere Universal Inverted Dome frosted version is great for diffused light that is relatively inexpensive compared to other options, and is more portable for outside photo shoots. What upsets me is that the dome can ONLY be used in the inverted position on this model. The Fong videos confirm that it has a center spot. Whereas with the newer flexible model you can use the domes in both inverted and rounded side. This is very disappointing for me since the rounded side offers softer diffusion. Now I have to buy the flexible one. May want to consider the newer model. Rated 5 out of 5 by Frosty from Best Diffuser As a Real Estate Photographer, I have to dodge more than my share of mirrors,stainless appliances, glass cabinet fronts, fireplace screens, glass doors, windows and glass covered pictures/artwork. All of these this obstacles produce reflections and flash reflections, but this diffuser eliminates solves the problem, while distributing the light evenly in each room. It's light-weight and easy to attach to a shoe mount flash. I borrowed one from a friend 6 months ago and immediately put it on my Wish List! Rated 2 out of 5 by Anonymous from Waste of My Money Basically... you buy so that you don't look cheap to other photographers. I get the very same effect using a rubbing alcohol bottle with the bottom cut out and placed over my flash. Same quality of light. If I want to compare my light with the clear lightsphere I can use a tupperware style bowl I get my greek olives in from the deli. Same quality of light. Total waste of money... unless you aren't embarrassed of a salad bowl/rubbing alcohol bottle on top of your flash. The unit does work fine and will be great for those whose reputation will not allow them to use a bottle/bowl from home. The Gary Fong Lightsphere Universal Inverted Dome Cloud Diffusion System is designed to fit on virtually any shoe mount flash, including the Olympus FL-600R. Will this fit my Canon 430 EX II? Fall off all the time. Not cut right on the inside to fit. what is the difference between frosted and half? Works reasonably well, but not an earth shattering item. Softens the light but I use for bounce as often as a straight on flash. The Lightsphere Universal is not designed for the SB-900 or SB-910. 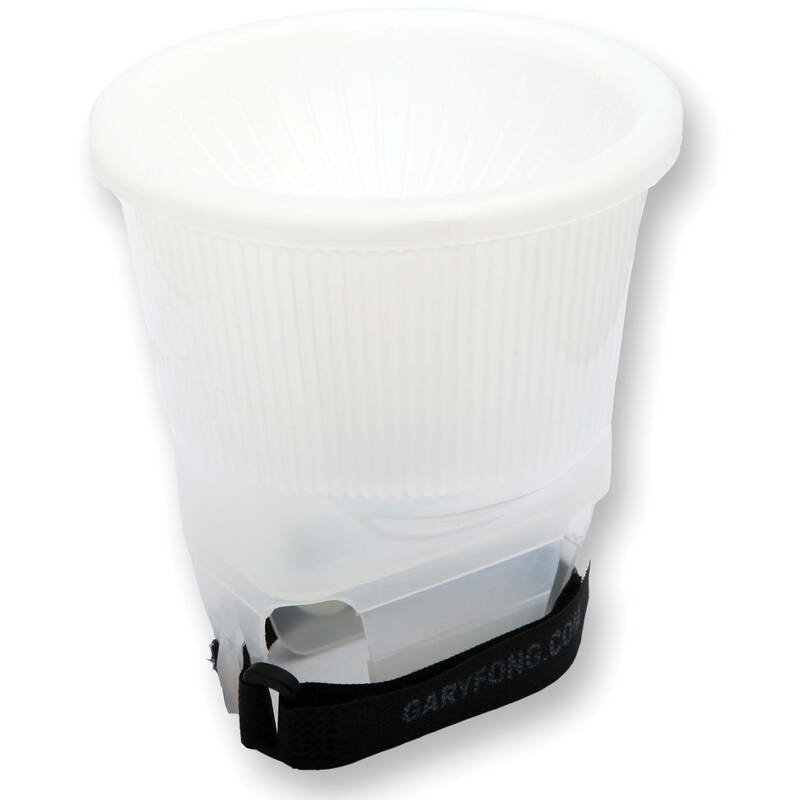 Instead, the Lightsphere Collapsible Speed Mount diffuser IS optimized for those larger flash units. Will this fit on a Canon 600? It has an expandable attachment sleeve and a Velcro strap which does make it universal for flash heads. The dimensions of the flashes I use (430 EX II) are nearly identical to the 600RT so it should fit with out an issue. Does Gary Fong Lightsphere fit Canon speedlite 320EX? Thank you. Yes it will but I don't know how tight. Will this fit the Godox V860II? It fits a Nikon SB60 flash head 1 3/4inch x 2 3/4 inch approx. The Gary Fong has an adjustable piece that fits over flash head and tightens by a velcro strap. Hope that helps. Makes my flash photography a whole lot better! Will Gary Fong Lightshere fit to Nissin Di700A fhash? Yes, it has an adjustable Speed Mount system that can securely fasten to a wide range of flash units, including the Nissin Di700A.